I was recently contacted by a publicist for Southern Living magazine and asked if I'd like to do a review of Southern Living's new look. A free magazine? Well, I suppose I could be troubled into putting the girls to bed a few minutes early to thumb through the October issue. In all seriousness, y'all know I am completely into fluff these days. I deal with kiddie drama all day long...if I'm going to take the time to read something, it had better be glossy and pretty and hold my interest longer than an episode of Max & Ruby. For the sake of complete disclosure, I'll admit that I let my SL subscription lapse a few years ago because I felt it was too pricey. I recently received a super (!) deal on renewal, so I was anxious to see how the magazine had changed. My package from Time Inc. arrived on Tuesday afternoon, and Jennifer included Southern Living's October issue as well as the November issue, and two copies of All You, which I have never sampled. Score 1 for Southern Living! The very first thing I noticed about the new Southern Living was the binding. No more sharp spines...I love that I can store the issue and see the month and highlights. I saw quite a few cute little projects in this issue that would be fun to take on. This little arrangement made with Moonpies fits "fun" and "Southern" to a T.
A step-by-step guide for those of us who don't have it all together and need a bit of guidance in our attempts to bring warmth and beauty to our homes. I was also more than pleased to see the "Mama's Way or Your Way?" column, in which the mag shares a recipe and offers the traditional version or an option to create the same great taste using some shortcuts. As a busy young mom, I love to cook, but I don't have the luxury of spending extra time at the stove...there are sippy cups waiting to be washed, a preschooler who wants to be read to, and a toddler hanging on my leg! As for All You, I wasn't sure what to expect. For some reason, I always associated it with those awkward discount magazines that advertise losing 47 pounds in a week by eating only tuna fish. Boy was I surprised when I flipped open the November issue to find decorating tips, recipes, budgeting ideas, shopping tips, and more! Those earrings are seriously cute, the shoes are calling my name, and I need that scarf! Not a leisure suit or mom jean in sight! I see a subscription to All You in my future! In the past, I thought of Southern Living magazine as something pretty to look at, but not at all relatable to my life. The gardening articles presented lovely back yard nature retreats, but no advice for young home owners like myself who might be new to the trade. The spreads featuring Southern homes were jaw-droppingly gorgeous, but they were always placed in my "too expensive," "maybe someday," or "not ever gonna happen" files. The key for me is that the magazine has managed to retain its elegance and traditions, but it acknowledges that life in the South is busier than it once was. Southern Living chose to update its layout, provide more helpful tips for those of us who don't have it all together, offer some fun new material, and still provides the same great quality to long-time readers. Here's a look at the November cover. I recommend checking it out. If you're hooked like I am, you'll be signing up for your own subscription! *Disclaimer: With the exception of the free magazines, I was not paid for my unbiased review Southern Living or All You magazines. This is a great review! 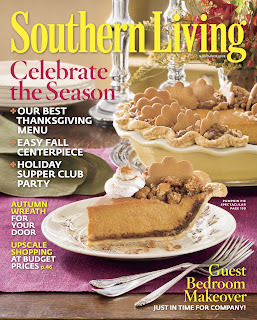 Southern Living looks like it has definitely changed for the better. I would love to check it out, but feel kind of excluded because I'm from the north. I wonder if that effects their sales... Maybe I should rebel and check it out anyway! Nice! What a great opportunity for you, I'll have to check the new mag out. Great review....and I love the All You mag, too; great coupons and ideas....as for SL, I am like you, so happy they brought some of the old mag back while keeping it up with the times as well! thanks for a good post! I'm 26 and live alone with my dog and cat in a one bedroom apartment...I don't even have a kitchen table, I eat at the coffee table every night - and you just made me want to subscribe to Southern Living. Great review! lucky you! i love SL in spite of the changes of the last year or so. i didn't even see the article about dining room sideboard step by step. gotta go back & read that! this month, pioneer woman's in it! wow! don't know if i want clothes in sl?? rather see more seasonal decorating, i think? Hey, Amanda, good review! In fact, I can't believe SL hasn't contacted ME for a review. I live right here in their hometown & I'm doing a post next week on the Nov. issue & wasn't even asked to. :) Anyway, I agree, they have totally made it better & now I'm a subscriber again. 1. What is your favorite movie? I love lots of movies, but Dances with Wolves is one of my all-time faves. Loved it! 2. Do you have a favorite Thanksgiving tradition? No, not really, just spending time with my family & eating LOTS of good food. 3. How early do you start Christmas shopping? I've pared down my Christmas shopping so much that I don't do a whole lot of it anymore. I have mainly started doing something crafty for my family instead of telling each other exactly what we want. Just got tired of the whole rat race of buying gifts at Christmas. Great review ! I heart that magazine. In fact, I've gotten in so much trouble with reading too many delicious glossy magazines, I've been cut off. Thanks for a sinful sneaky peek at this issue. Ssssh, don't tell my hub. LOL. That was a wonderful review - thank you for sharing!! And I'm returning your lovely bloggy visit too! I let my SL sub lapse every year, and then wait for the super cheap "please come back" mailing. Either that or find it on ebay dirt cheap. BTW, aren't you lucky to be asked to do a review! treatment of an ointment or cream, for healing the parasitic sores.